What I envisioned: Attaching a broadhead to my arrow, blowing a quick “whhhh” across the top of it, seeing the gleam of a sparkle on its razor sharp edge, and hearing it give off a high-pitched “zing” sound. What actually happened: Splicing my finger on the broadhead’s razor sharp edge. What I envisioned: Dressing in camo and looking like one of those ravishing women on the cover of a Cabela’s magazine. What actually happened: Dressing in camo and looking like a 13-year-old boy from Kansas. What I envisioned: Spreading around corn to lure in a monstrous buck. What actually happened: Spreading around corn to lure in 3 squirrels. What I envisioned: Sneaking around like a stealth and being completely covert. No noise. No movement. What actually happened: Luke Brian ringtone blaring through the woods because I forgot to put my phone on silent. What I envisioned: Sitting up in my treestand for a few hours enjoying all the beautiful sights, sounds, and smells Mother Nature has to offer. What I envisioned: Stocking my freezer with venison at the end if the day. What actually happened: Taking a roast out of my freezer to make this Beef Burgundy. So, I didn’t do too well. Any hunters out there have advice for me? I’ll take all the help i can get. 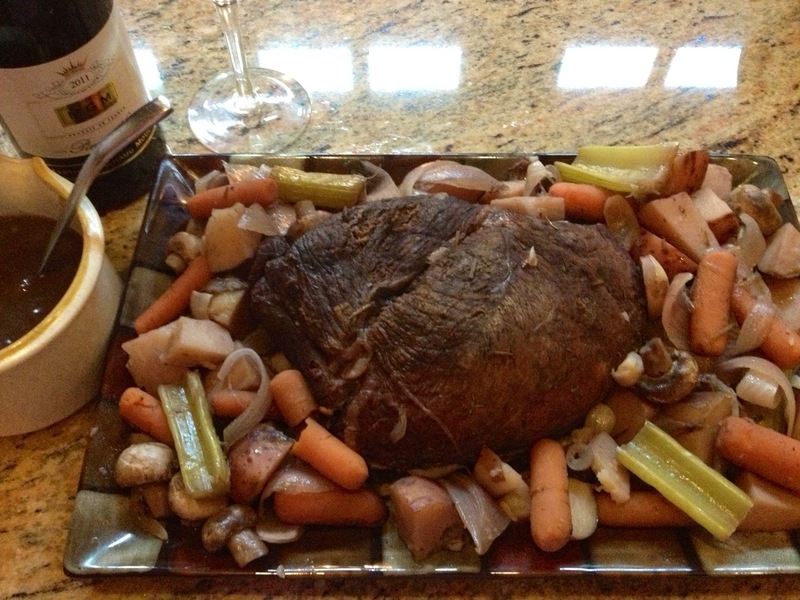 Pour wine and beef bouillon in a crockpot and stir to dissolve, then place the roast and the garlic cloves in. Chop the vegetables, aside from the mushrooms, into large pieces and put them all on top of the roast. Season with rosemary, salt and pepper. Set the crockpot to low for 8 hours. Add the mushrooms for the last hour of cooking. When cook time is complete, transfer the roast and all the vegetables to a serving platter. To make a gravy, combine the butter and flour in a saucepan and cook over medium heat, making a rue. Add the remaining juices from the crockpot and continue cooking, stirring until thickened.